On average, organizations in the U.S. raise 30 – 40% of their annual income during the last few weeks of the year (according to our friends at Network for Good and Charity Navigator). 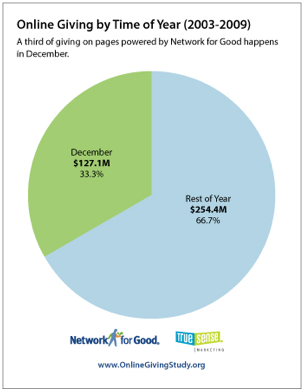 More than 30,000 individuals made close to 40,000 donations in November and December. More than 700 people signed up for recurring donations for a total of more than $28,000 a month! Why the spike in online giving? In the U.S., all tax deductible donations to non-profits must be made before the end of the year (Dec. 31st) to be eligible for deduction from 2013 taxes. December is also the month of popular American holidays such as Christmas and Hanukkah. Last year, Americans spent $249 billion on and off-line during the holiday shopping season; 2.5% more than the year before. And online sales continued to sky-rocket. Online shoppers spent 17% more on Cyber Monday (the largest online spending day in history!) in 2012 compared to the previous year. December 29, 30, 31: The biggest fundraising days of the year! Participate in one of our three holiday promotions: Gifts for Good, Year-End Campaign, and Recurring Donation Match. Join us for a one hour webinar on Thursday, October 17th to learn more about these exciting campaigns! Sign up here. Improve your project ranking. GlobalGiving ranks all GlobalGiving projects using four criteria—the amount of time since the last project report, the number of donors, total money raised, and proximity to fundraising goal. Read more about project ranking here. Attract holiday donors to your project by improving your project rank! Become a GlobalGiving Superstar. Increase your chances of being recommended to a GlobalGiving corporate partner this holiday season. Become a Superstar in our Partner Rewards Program. See your Partner Rewards Level in the upper right hand corner of your project entry dashboard on GlobalGiving!